‘Six men. One game. A hundred dreams.’ This is just a short outline of what is in store in the biggest budget movie ever to be made in Sri Lanka. Super Six centers on one of the country’s passions, cricket. The spirit of the game along with sub themes like friendship, romance and rivalry make up Udara Palliyaguruge’s cinematic debut. Roumoured to be the largest commercial budgeted movie to be made in Sri Lanka with a production cost of Rs 77 million, Super Six comprises a cast of over 600 artistes. Around 160 actors will portray roles on screen while 90 technical staff will work on the sets. The cast led by Roshan Ranawana, Saranga Dissasekara and Hemal Ranasinghe includes Sanath Gunatileke, Mahendra Perera, Paboda Sandeepani, Duleeka Marapana, Maleeka Sirisenage, Anton Jude, Suneth Chitrananda, Sangeetha Sadani, Manike Attanayake, Chitra Warakagoda, Priyantha Seneviratne, Rodney Warnakula, Jeevan Handuneththi and others in significant roles. Former Miss Sri Lanka Aruni Rajapaksa will make her debut to cinema in the film. Director Paliyaguruge is well versed in the arts scene. He holds a degree in Cinema from the Asian Academy of Film and TV, India, and diplomas in Fine Arts and Mass Media. He was trained in filmmaking at the New York Film Academy, USA. Having directed over 500 television commercials Paliyaguruge went on to excel as a program producer and director for MTV Channels (Pvt) Ltd. He is also the head of Aristo films, a local film production company founded in 2005. “The film captures the spirit of one of Sri Lanka’s favourite pastimes. It focuses on a group of youths from Moratuwa who engage in a battle for power by competing in a six a side tournament,” Palliyaguruge noted. He also stated that the match is intertwined with incidents from the team’s off-the-pitch lifestyles. Humour, music and romance are combined into the plot. The ultimate price is in the life experiences and lessons that the youths share on their winning streak. Yet the conquest does not lie in winning the match. Rather it is a triumph through loss. “The ending is not the conventional victory that you might expect to see in most of the stereotyped sports movies. It is a unique project of high quality from the cast to the technological features. It will mark a milestone in my life for it is a dream I have been striving to achieve,” the director who had thought out of the box revealed. Super Six will be produced by R Sadesh Kumar and Shrimathi Sadesh Kumar on behalf of Real Image (Pvt) Ltd.
Donald Jayantha is the assistant director, Anura Ekanayake the script writer, R Costa the cinematographer and M Ayagama the art director for Super Six. The production managers are A Ariyaratne and Shanaka. The costume designer is Sumathi Kudaligama while the make up department will be handled by I Udaralanka. Mahesh Denipitiya and Iraj Weeraratne will handle the music and Nilar Cassim, Nandana Wickramage and Wasantha Bandara Dukgannarala penned the lyrics which will be sung by Rookantha Gunatileke, Champa Kalhari, Shihan Mihiranga, Surendra Perera and Iraj Weeraratne. Filming began in Sri Lanka and Malaysia and will run till November. The cinemascope DTS Dolby project promises to bowl over moviebuffs as it hits the wide screen within a year. Cricket fever continues in Suneth Malinga Lokuhewa’s debut cinematic venture Sinhavalokanaya. The movie which had been shooting in the cool and misty climate of Hantana in July concluded shooting at the NCC sports ground recently with cwlwbrated cricketers Lasith Malinga and Tillakarate Dilshan exhibitiong some of their talents for the camera. Here is a peek at what is in store as Daily News ‘Projector’ got together with the team in their ventures in the hills. Trekking up the greeny hills with the cast who were clad in traditional Sinhala garments you’d wonder if you have transcended back in time to the 1940s. This is the period when patriotism reigned and Sri Lanka was about to break free from colonialism. First up you have Sanath Gunatileke sporting the attire of a town headsman. Dillhani Ashokamala, dressed in a jacket and sari, carries off a traditional village woman. Damitha Abeyratne and Kusum Renu too have been transformed to take on the look of the 1940s with their finely embroidered blouses and colourful saris. A smiling Raini Charuka Gunathilaka, daughter of yesteryear singing duo Rukantha and Chandraleka Gunathilaka, and the lead actress of the movie poses for a picture with her leading man, Delon Jayasinghe. Both youths will make their entrance to the reel with the movie. 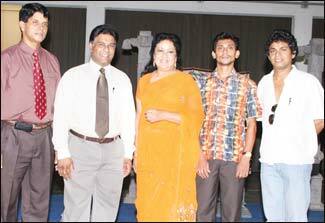 Music fans will no doubt remember Raini for the track she sang with Gypsies leader Sunil Perera’s son Gayan Perera. The theme of the movie is based on cricket. It is a sport that was introduced to us by the British. With the passage of time locals took to the game with zest and excelled in the techniques. This real-life journey is mirrored in the plot which deals with two teams, one comprising Sri Lankans and the other British, competing against each other. Flowing along with the game is a touching love story between one of the key players of the teams and a village lass. Their relationship is suddenly disrupted by a third party in the form of a British lady who helps the team to learn the game. Will the Sri Lankan team overcome the hurdle? Is more than just their pride on the line? Moviegoers will have to wait for the answers till the project finishes shooting and joins the queue to be screened at theatres. Irangani Serasinghe, Menaka Rajapaksa. Cletus Mendis, Jayalal Rohana, Palitha Silva, G R Perera, Gamini Hettiarachchi, Seetha Kumari, Moreen Charuni, Pubudu Chathuranga and others too portray roles in the Sinhavalokanaya. Prathiroo (Images), the maiden cinematic venture by Dr Kapila Krishantha Sooriyarachchi is a mark of tribute to war heroes and their families. Set in the rural backdrop of a village in the island, the story revolves around a courageous village woman named Leelavathi and her son, Wickrama Ranaweera. Wickrama is a studious lad. He excells in studies and is a bookworm. However his world changes in an instance when the villagecomes under LTTE attack. This incident changes his destiny. He decides to join the army with his mother’s blessings. Army life sharpens his determination to free his motherland from the clutches of terrorism. However he is torn apart once he gets news that his mother is fatally ill. He wavers between the decision of returning back to the village to take care of his frail mother and the need to serve his country. His mother relates that there is no difference between the mother who bore him and the country which provided the background for his upbringing. The movie flows along with Wickrama’s decision and his attitudes towards his two mothers: the mother who gave birth to him and motherland. Director Dr Sooriyarachchi is a past pupil of Ananda Central College, Elpitiya and D S Senanayake College, Colombo. He joined the Russian State University in 1983 and graduated in medicine. He had studied drama and acting at Gorky Arts Faculty and had been a drummer and vocalist for the university’s music band. He had also made his mark in the motors sports sene in Russia. He had worked in the medical profession for eight years in Polonnaruwa before becoming the Communication expert at the Health Education unit. He had spearheaded many documentaries, teledramas, tele films, cartoons and commercials embodying health issues and had put together a 80 song community musical program named Sala Nisala. He is also a well known lyricist and has penned around 120 songs. After becoming the first physician to make a teledrama series he is set to be the first physicians to make a film with Prathiroo. The movie will star Malani Fonseka, Joe Abeywickrama, Jagath Benaragama, Veena Jayakody, Sriyantha Mendis, Palitha Silva, Giriraj Kaushalya, Vijeratne Warakagoda, Jagath Chamila, Gamini Hettiarachchi, Damayanthi Fonseka, Sujeewa Priyalal, Dharmapriya Dias, Himali Sayurangi, Dilini Lakmali, Bandula Wijeweera, Kaushalya Samarasinghe, Sampath Jayaweera, Dimuthu Chinthaka, Nupura Isindu and Vihanga Nimeshaka. The movie will be produced by Dr Harishchandra Yakandawala and Dr Kapila Krishan Sooriyarachchi. Jayaprakash Sivagurunadan is the Assistant Director while Ravindra Guruge is the Editor. Chandana Jayasinghe is the cameraman, Dharshana Ruwan Dissanayake is the Music Director, Imal Shanaka Peries is the make up artiste, Aruna Dias is the Art Director and Heminda Veerakoon is the Production Manager of Prathiroo. Amarasiri Peries will sing the theme song. Yvan Attal est le candidat, a French film by Niels Arestrup, subtitled in English will be screened at the Alliance Francaise de Kandy on September 18 at 3.30 p.m. The plot is very simple. After the unexpected withdrawal of the initial candidate, Michel Dedieu is designated by his party to continue the presidential campaign. 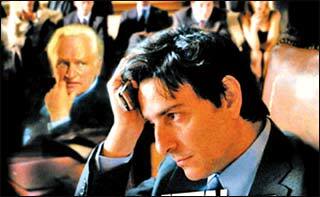 Dedieu, a reticent candidate, must face its adversary the popular Eric Carson during a televised debate. In order to improve Dedieu’s image in front of the media, he gathers a group of advisers in a residence in province. There he has only a few days to prepare himself for the coming debate. But behind this simple plot lies a very complicated and intriguing subject. Arestrup has chosen not a particularly easy subject for his first film as a director. But compared to some American movies on the subject, The Candidate succeeds in reflecting the French political mentality bas well as the situation in Europe. The ups and downs of the central character, played brilliantly by the talented Yvan Attal, are revealed with such elegance that only an actor turned director could achieve. The film itself is not your usual political drama packed with fast paced dialogues and explosive scenes. It actually possesses the fine quality of a good theatrical performance which makes it an even more enjoyable viewing! The tall, distinct actress of Bollywood Tabu has been successful down south due to her flexible performing style. Having been familiar with the south industry, Tabu has yet again given her consent for Urmi, the much talked Santosh Sivan’s Malayalam venture that stars Genelia D’souza in lead. While Vidya Balan giving a special dance number in the movie is already out, the latest striking entrant is like icing on the cake. Set in the 15th Century, Urmi is a period drama that deals with the murderer of Vasco Da Gama. It’s also heard that filmmaker-actor Amole Gupte of Kaminey fame has a role in the film.